German physicists have discovered that at negative temperatures, atoms are approaching infinitely hot. Research physicists at the University of Munich in Germany have built what was previously only theoretically possible: a system with negative temperature. 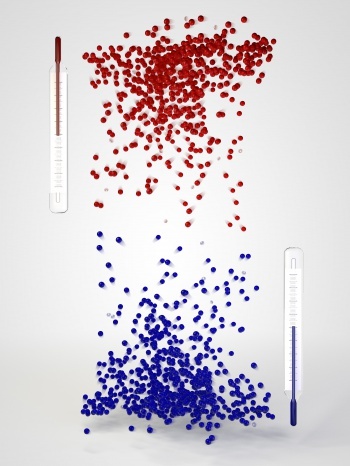 While absolute zero, the temperature of minimum molecular motion, is still unreachable, these scientists have pushed to the other side of zero and found a negative temperature system. Negative temperatures don't actually have "less" energy than zero, or actually take up some state "below" zero, but they do have some strange and bizarre properties. Whereas in a normal system atoms spread out evenly across all available states as energy increases, leading to an increase in entropy, in a negative system the atoms begin to occupy the maximum possible energy state at the same time - leading entropy to decrease as energy increases. This is the point where you've reached negative temperature. As one scientist put it, "the gas is not colder than zero Kelvin, but hotter. It is even hotter than at any positive temperature - the temperature scale simply does not end at infinity, but jumps to negative values instead." Theoretically, this innovation could lead to more than 100% efficient engines, because of the way heat would flow around the entropy sink that is a negative system. "Heat would flow from a negative to a positive temperature system," said a study scientist, "because negative temperature systems can absorb entropy while releasing energy, they give rise to counterintuitive effects." The authors' major hope is that the behavior of a negative system will lead to greater understanding of dark matter, the mysterious force that might be behind the expansion of the universe, because it appears that the "negative pressure" effect dark matter has is similar to what negative temperatures do. Any new developments will have to wait, though, because as it stands the negative system was stable for only hundreds of milliseconds - enough time to gather data and do little else.